Dr. Rajeev Khaja; Prof Kari Dunn Buron; Mr. Bertrand Moses;Mr. Mark Bompart; Her Worship Lisa Ramsumair-Hinds; Mr. Jonas Torrance and moderator Suzy De Verteuil. 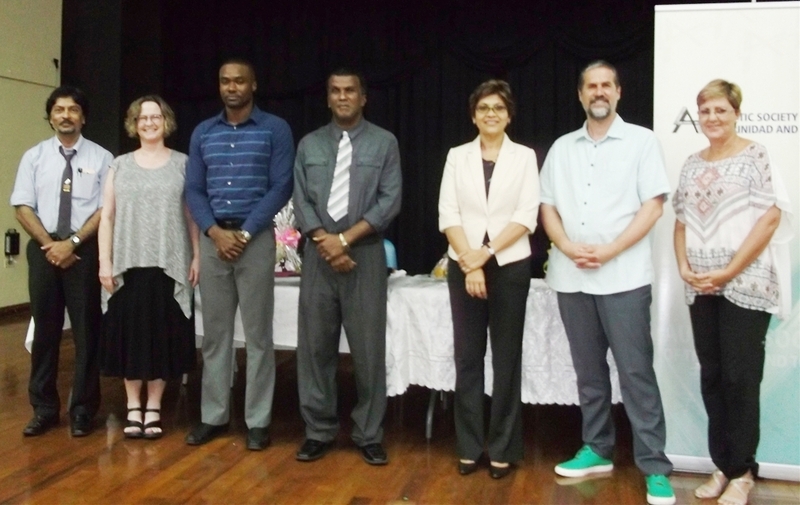 On Friday 19th February the Autistic Society of Trinidad and Tobago (ASTT) culminated a week of workshops on addressing issues of challenging behaviour by hosting an Autism Seminar at the Cipriani College of Labour and Cooperative Studies. This public seminar featured guest presenter Mr. Jonas Torrance, Therapy & Behaviour Management Co-ordinator and Dance & Movement Psychotherapist from the Oxfordshire Service for Autism, who gave an insightful look into autism and challenging behaviour. Specific challenges related to legislation and policy regarding the restraint and treatment of persons on the autism spectrum were also addressed by Mr. Torrance with contributions from a distinguished panel of guests including, Her Worship Lisa Ramsumair-Hinds, Magistrate at the Judiciary of Trinidad and Tobago; Dr. Rajeev Khaja, Psychiatrist at St. Ann’s Psychiatric Hospital; Prof. Kari Dunn Buron, Autism Education Specialist from Minnesota,USA; Mr. Bertrand Moses, Child Developmental Specialist at The Gender and Child Affairs Unit of the Office of the Prime Minister; and Mr. Mark Bompart, Officer at the Youth Training Centre. Discussion engaged with members of the audience concluded with a recognized need for formal behaviour management policies regarding the fair treatment of persons with autism. ASTT hopes to collaborate further with relevant stakeholders on this issue, and wishes to thank members of the panel, specially invited guests and members of the audience for their participation and input.